This recipe and video covers a type of cooking known as Sous Vide. It's French and means cooking under vacuum in a Water bath. This technique has become a common use in many high end restaurants. The benefits to using this technique are consistency, flavor, tenderness without over cooking. So lets get to cooking! 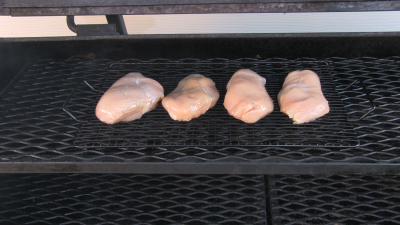 Start by pre heating your Sous Vide water bath to 146 Degrees F. If you don't have a Sous Vide cooker then use your smoker, grill or oven to cook the chicken breasts to 165-168 F.
Trim 4 boneless, skinless chicken breasts. 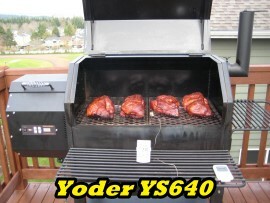 Fired up your cold smoker. 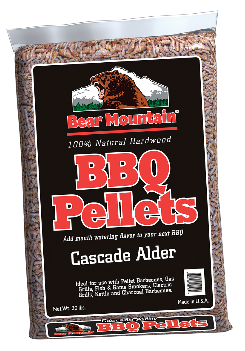 I'm using the the Amaze-N-Tube-Smoker filled half way up with Bear Mountain Cascade Alder pellets. Once my cold smoke is rolling place the chicken in chamber (no heat) just cold smoke. Allow the meat to bask in the Alder smoke for 1.5 hours. During this cook the outside ambient temperature was 43 degrees F. Keep in mind if you do this in hotter temperatures you may want to reduce the smoke time to avoid food safety issues. Once the Chicken is cold smoked for the 1.5 hours, season the chicken on both sides with onion powder, garlic powder, coarse ground black pepper, sea salt and then placed them into vacuum sealer bags. To each bag I added two sprigs of rosemary on top each breast. Next apply vacuum removing all air and then sealed the bags. In this case I used the Vacmaster Pro305 which is an excellent commercial grade vacuum Sealer. Once sealed, place the bags into the 146 degree F water bath to cook for 3 hours. 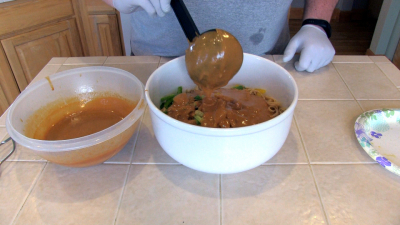 While the chicken is cooking make the Thai Peanut Sauce. In a medium bowl thoroughly mix the following. Chop 1/2 cup of parsley and finely chop 1/2 cup of peanuts. Set these aside as they will be used in the very end. Now start the noodles. Bring 4 to5 quarts of water to a boil. Add 1 tbsp. Olive Oil and a pinch of salt. Add one box of Linguini noodles. Boil for 10 minutes and then drain. Rinse with cold water to cool down the noodles. I like to serve room temperature noodles with hot chicken on top. 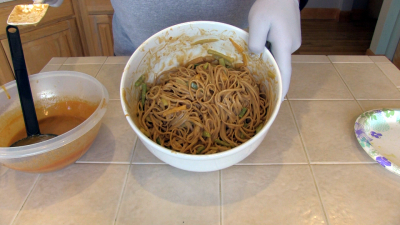 Once the noodles have cooled, dump them into a large mixing bowl. Add the following. Dump in about 2/3 of the peanut sauce. If you like less, then dump in the amount you prefer. Mix thoroughly, cover and place in the refrigerator. 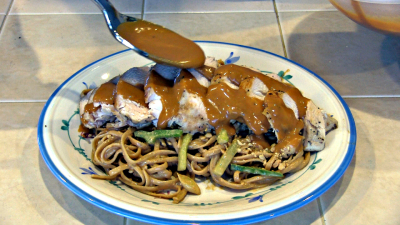 Cover the remainder of peanut sauce and set it aside. You can take the noodles back out when the chicken is 30 minutes from being done. Once the chicken has cooked for the 3 hours, removed them from the water bath and placed on paper towels and Pat dry with a paper towels. Next heat a skillet on high until the skillet starts to smoke. Pour in a couple Tbsp. of extra virgin olive and add the chicken to the skillet. Sear 1 minutes per top and bottom. 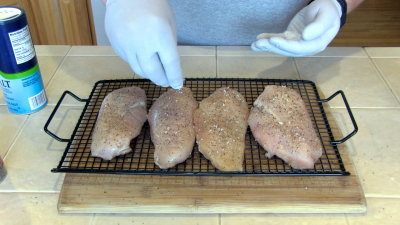 Once the chicken breasts are seared, its time to slice the chicken. Slice across the breast into 1/4" slices. 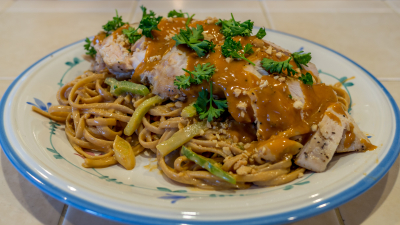 Place your desired amount of noodles onto a plate. Sprinkle on some of the chopped peanuts. Place the sliced chicken on top. 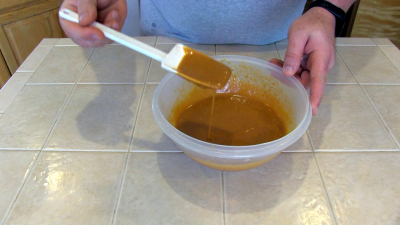 Drizzle on a liberal amount of the Thai Peanut Sauce. Sprinkle on some more chopped peanuts and then garnish with parsley. That's it! Enjoy this gourmet dish.